Former Newcastle United Under-23s coach Peter Beardsley has been charged by the Football Association with three counts of using racist language to players. Beardsley, who left United this month after a 14-month club investigation, has "categorically denied" the claims. Anti-racism group Kick It Out had said it was "concerned" Newcastle had not revealed the reasons for his departure. Beardsley faced multiple complaints, including one of bullying by 22-year-old midfielder Yasin Ben El-Mhanni. Newcastle have declined to comment. The FA said: "It is alleged Mr Beardsley used abusive and/or insulting words towards Newcastle United FC Under 23 players, which were contrary to FA Rule E3(1), whilst employed as their coach. "It is further alleged these words also constituted an 'aggravated breach', which is defined in FA Rule E3(2), as they included reference to ethnic origin and/or colour and/or race and/or nationality." The former England international has until 12 April to respond to the charges. Kick it Out said it "noted" the FA charge and "repeat our call for the club to be transparent about the findings of their own investigation into this case." Beardsley, who had been U23s coach at Newcastle since 2009, had been on leave since a club investigation into racism and bullying allegations began last year. 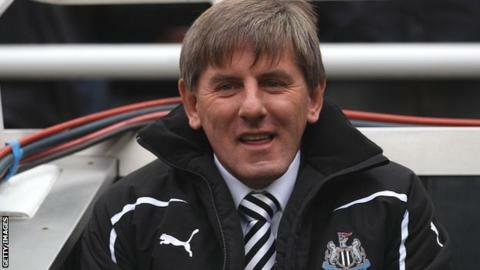 After he left the club, Beardsley, who made 326 appearances for Newcastle as a player, said the "time was right to seek a new challenge". He added: "I have always honoured my contractual obligations of confidentiality to the club and maintained my silence, which has in itself been very difficult." Newcastle said they were "grateful for the contribution Peter has given over the years as a player, coach and ambassador and we wish him well for the future". In 2003, Beardsley and academy director Kenny Wharton faced a Premier League investigation over allegations of bullying made by youth players James Beaumont and Ross Gardner but the case was dismissed.